Here is a snap shot of the love seats, also known as "Kærlighedssæder." Photo via Kadaver Off the Record. Looking for love? Ride the bus! Starting on May 3, Danish transport company Arriva introduced red-upholstered designated “love seats” on more than 100 buses in Copenhagen to encourage flirtation, smiles, romance and happiness among the city’s passengers, whether they’re happily single, married or still looking for love. The bigger idea — besides being cute — is to get people to leave their cars parked at home and enjoy riding public transportation, as more of a social endeavor. The love seat experiment will last for two weeks. Maybe the Danes are really on to something. How can we make public transportation more socially appealing? 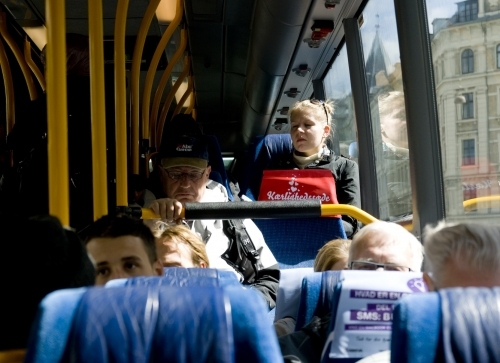 There are scores of studies that show the extent of anti-social behavior on public buses. A Scotland study found the main types of behavior to include “rudeness/verbal abuse, drunken behaviour, the dumping of litter/rubbish and smoking cigarettes.” To reduce these nuisances, the study says, solutions may include installing closed-circuit television cameras and “safety screens,” or hiring undercover police and police escorts on important routes. But wouldn’t that just add to a heightened level of insecurity, paranoia and sterility? And let’s not forget that poorly designed inconvenient transportation — whether it’s overcrowded, delayed or noisy — can also contribute to stress and tension. Earlier this year, a study was released that showed the social needs and behaviors of more than 1,700 train and bus riders in New Zealand. The researcher, Jared Thomas, found that 50 percent of respondents said they intentionally engage in isolating activities, such as listening to music or reading, to discourage conversation. The conclusion? “Side-by-side seating arrangements and standoffish behaviors create a socially uncomfortable environment akin to a crowded elevator.” It appears that in an effort to maximize capacity, buses have ignored interpersonal comfort.